Education: George Mason University (degree in foreign language), and Universidad de Salamanca, Spain. 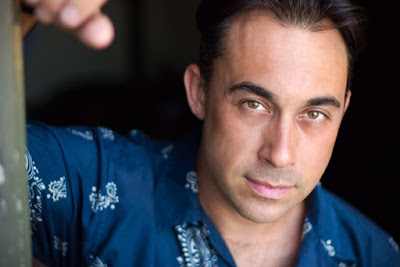 Select Credits: Original Broadway Cast: Shrek, Original Off-Broadway Cast: Altar Boyz (Drama League nomination), original series: Benny Costa in "He’s With Me". Why theater? : Theater is accessible and it’s a fully realized and unique experience each performance. Who do you play in Liberty? : I play James Goodleaf, a Mohawk Ironworker, and Frederic Bartholdi, the man who created the Statue of Liberty. About Liberty: Liberty is a compact and emotionally charged musical based on real people and events that shaped the American cultural and ethnic landscape told through the eyes of a young girl who represents the statue itself. Being a part of Liberty: I love representing people of the American past and being a part of truth-telling in this show. I particularly appreciate the presence of my character, James Goodleaf, who for the first time, can leave the reservation to seek work in a growing city. Native Americans are often pushed to the back of the historical narrative and primarily seen in a pre-colonial context. It’s a voice missing from much of contemporary society and their past has been either erased or fabricated to suit the power-holding group. I think this memory (the issues and happenings in this show) is persistent because they continue to repeat themselves throughout history and the conversations are still happening now. The issues of immigration and question of who gets to inherit or achieve the American dream (and be protected under it), is currently a political issue and seems to always be on the table. What kind of theater speaks to you? What or who inspires you as an artist? : I really have two strong sides to my theatrical taste. I love comedy and I’m a comedian at heart. I love a great comedy weather it be a play or musical. I particularly love bizarre humor and humor that knocks a system. In recent years I’ve loved shows like Hand to God, Book of Mormon, Circle Mirror Transformation, and parodies like Silence!. I also love hard-hitting cultural and political shows like Ruined, Passing Strange, and of course Hamilton. Some shows are a great combination of both and leave a lasting impression on me like Nilaja Sun’s No Child. This is pretty eclectic for me. I draw inspiration from so many; People who are creating and making history: My friend Camille A. Brown is an inspiring and brilliant artist and choreographer creating pieces that explore and represent the voiceless or under appreciated; illuminators like Lin-Manuel Miranda, Dominique Morriseau, Alex Timbers, and my good friend Tracie Thoms among so many others; great comedians and storytellers such as John Leguizamo, Whoopi Goldberg, Christopher Guest, Key and Peele, John Stewart, Samantha Bee, and so many more. I’m also inspired greatly by the kids I perform with in hospitals working with Only Make Believe. It’s a real joy. There are artists all around me inspiring me all the time. Any roles you’re dying to play? : I can’t think of any right now. Haha. I’m so bad at this question. I’d really like to continue creating new roles and putting them out into the world. What’s your favorite show tune? : The entire score of Once on This Island. If you could work with anyone you’ve yet to work with, who would it be? : I’d like to work with Casey Nicolaw and Mary Zimmerman. I really like what they do. If you could go back in time and see any play or musical you missed, what would it be? : I’d like to go back and see the original production of Hair. What show have you recommended to your friends? : Lately, it’s been Robber Bridegroom. Leslie Kritzer is killing it. Biggest guilty pleasure? : Giant plates of nachos followed by "News Anchor Fails” videos. What’s up next? : I’ve been writing a lot lately. I have a bunch of short scenes that are waiting to be discovered. I also just finished writing an original series for a friend. I’m also in development with a few different shows that will hopefully be getting productions soon; (Table, Distant Thunder, and Gettin’ the Band Back Together).